It’s always been my dream to live on a ranch; to be able to just step outside into the open, rolling hills and hear the whinny of my very own horse. Although this dream hasn’t yet become a true reality for me yet, in a way it has become a dream come true as I have jumped head-first into the lively world of fourteen year old Christian ranch girl, Abby Lovitt. Pulitzer Prize winning Jane Smiley’s captivatingly simple writing style, as she embodies this junior higher, has kept me anxiously turning the pages of her classic equestrian masterpiece A Good Horse. Oak Valley Ranch was a happening place in the mid-1900’s. The Lovitt family, whom I am positive all readers will come to know and love, owns this ranch, and are comprised of the born horseman Mr. Lovitt, his wife, tender Mrs. Lovitt, and their daughter Abby. The journey begins as Abby turns fourteen in the beginning of her second year of junior high and quickly learns that things are changing. The bond between her and her gorgeous new colt Jack, is growing more indelible by the second, her obvious show jumping talent is more blatant than ever before on her marvelous horse Black George, and just as all of this joy and hope reaches its highest point, she receives a series of letters in the mail that threatens to take it all away. After months of tiresome research and investigation, Howard W. Brandt of Brandt and Carson Agency has decided to contact the Lovitt residence with the troubling news that their beloved Jack might be one of the foals born of four valuable mares who had been stolen off of a racing stable in Texas a year earlier. Jack is therefore a valued racehorse-to-be who might not even be rightfully belong the people who love him. What will become of the joy of Abby’s life? What extents will people take to get the treasured Thoroughbred in their possession? Will Abby’s Christian faith keep her standing strong? Fall in love and ride along with Abby as she embarks on her mission to take the world of show jumping by storm and keep her cherished colt while doing so, no matter what. Abby is no doubt one of the sole reasons I loved this story. She reminds me of myself, and that made this book so much easier for me to follow, especially through the slower parts. She has a natural, raw talent as an exceptional rider, and her indelible love and passion for her horses, especially Jack is blatantly obvious throughout the book and in the following quote, “And even though I had fed him before going to school that morning and I saw him every single day and he always trotted over to the fence as soon as I approached and stretched his head out for a pat, and then followed me to the gate, and was in every way a kind and affectionate horse, there was something about this whinny and the way he tossed his head to say ‘Hey! You’re home! I missed you! Let’s do something!’ that brought tears to my eyes because I was so lucky” (4-5). Her strong Christian values and simple, true ranch-girl spirit ring out strong and true as Jane Smiley perfects the art of capturing the opinionated character of a junior higher with the unique voice of Abby Lovitt. The true, overarching theme of this book is directed mainly toward the Christian audience and is very true and important. As we learn throughout this book and especially as a result of the conclusion, following after and submitting to the will of God is not always the easy thing to do, but it is always the right and prosperous thing to do. This is made evident by the following quote in which Mr. Lovitt “kissed [Mrs. Lovitt] on the forehead and said, ‘The Lord will provide’” (120). We also learn from Abby’s story and experiences that family needs to stick up for each other, and your bond with your family will ultimately make it or break it for you, especially in the face of competition and trials. 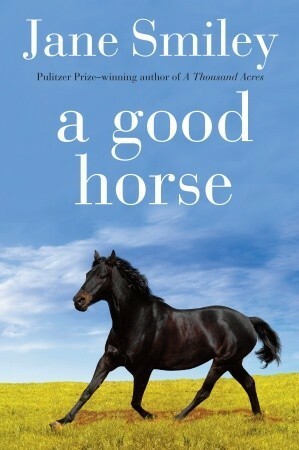 The author’s easy-to-follow and relatable writing style, lovable, absorbing characters, and complicated plot will be more than enough to get any horse person, any animal lover, and besides that, any girl who likes a great, but at times rather slow, read to keep turning this pages of this classic equestrian masterpiece. If you are a boy or need a book that has no lack of suspenseful action, then this might not be the book for you. I know this book will be a beloved classic of mine, and countless others for many years to come. This entry was posted in Book Reviews by SMES Student. Bookmark the permalink.